Epimaco A. Velasco (December 12, 1935 â€“ January 27, 2014), popularly known as Epi, was a Filipino politician, DILG Secretary, Governor, NBI Director, first NBI Director who rose from the ranks; worked as a bailiff at the Manila City Hall while studying law; rose to prominence at the NBI with the killing of the Number 1 Most Wanted Man in Cavite, Leonardo Manecio aka Nardong Putik. Epimaco Velasco was a big man literally (6â€™1â€) and figuratively. So his passing last Monday from heart attack is like the felling of a large tree: it leaves a huge hole in the forest canopy. He was 78. Uncle Epi rose to prominence in the NBI with the killing of the Philippinesâ€™ most wanted man, Nardong Putik, in 1971. In 1992 he became the first NBI director to rise from the ranks. Thence he became governor of Cavite (1995), and Secretary of Interior and Local Government (1998). He lies in state starting today at the San Agustin Church, Tanza, Cavite. Cremation on Sunday 9 a.m., then from the ancestral house on Calle Bigti, funeral march at 3 p.m. to the Santa Cruz Cemetery. As a fugitive, Putik and his men continued to instill terror in Cavite. Among the cases he was involved in were the illegal cultivation of marijuana and money extortion activities. On February 10, 1971, the National Bureau of Investigation's Narcotics division surveyed a marijuana plantation in Imus, Cavite allegedly being protected by Putik. Two NBI Agents, Rogelio Domingo and Antonio Dayao were captured, tortured, and killed by Nardong Putik and his men. The incident sealed Putik's fate: Angered by the heinous crime, NBI Director Jolly Bugarin ordered all his Agents to capture dead or alive Nardo and all responsible for the death of Agents Domingo and Dayao. NBI Agent Epimaco "Eppy" Velasco was then installed as the new Chief of the NBI Narcotics Division. In a month's time, they were able to record the movements of Nardong Putik. Later, with enough data, they were able to track his full whereabouts confidently to enable them to launch the operation to capture him on October 10, 1971. The operation which was a joint NBI-PC-Imus police force was composed of some 20 men. Troopers from the 233rd PC Company were led by Capt. Manuel Bruan. At 5:00 in the morning, the light of the house of the mistress of Nardo went out. After a few minutes, Nardo drives his Chevrolet Impala car out to the main Manila-Cavite highway. For unknown reasons, or maybe Nardong Putik senses that he is being tailed by the Philippine Constabulary, he was able to escape the PC dragnet or checkpoint at Panamitan and Talon, Kawit, Cavite. However, Nardong Putik did not notice a Volkswagen Kombi tailing him in the highway at the same time. The Kombi contained NBI Agents Velasco, Nasol, Utico, Bautista and others. They chased Nardo's car, and at Noveleta, Cavite, they were able to overtake the Impala and was at the right side of the car. Velasco shouted "NARDO!". He sensed the danger and immediately reached for his .45 pistol. At that moment, the NBI Agents opened fire with their revolvers, carbines, and submachine guns, peppering the car, and causing Nardo's instant death. The car lurched to the side of the highway and stopped. The Agents then immediately jumped out of their vehicle and took cover. Some Agents were still firing their guns to make sure that Nardo will not retaliate. The Impala was later hauled into NBI Headquarters in Manila, with the dead Putik inside, in full view of Director Bugarin. The news became a flash report on local television, and a top newspaper story the next day. That mission cemented the fame of Agent Velasco, who later became NBI Director in the nineties. 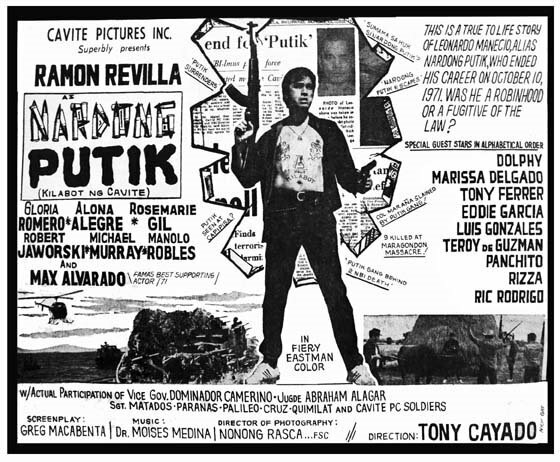 cavite pictures inc. superbly presents ramon revilla (senior) as some kind heroic robin hood? !